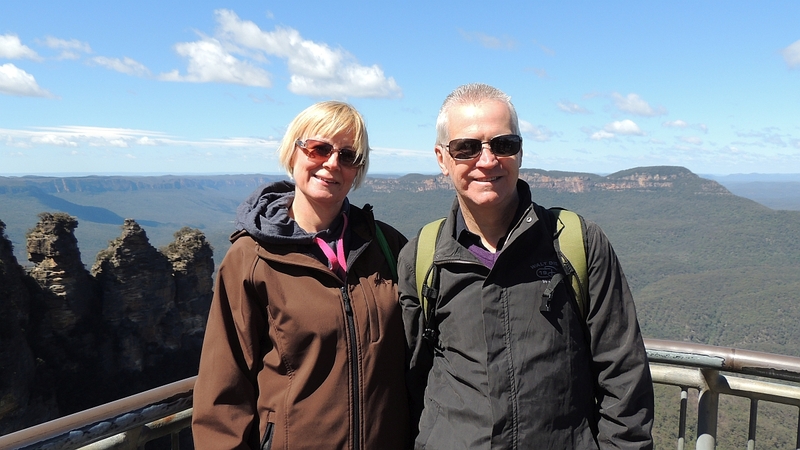 Up early and head off at 9am as we have a day out in The Blue Mountains today. The journey is lovely as we head out towards the mountains, which we can see on the horizon. 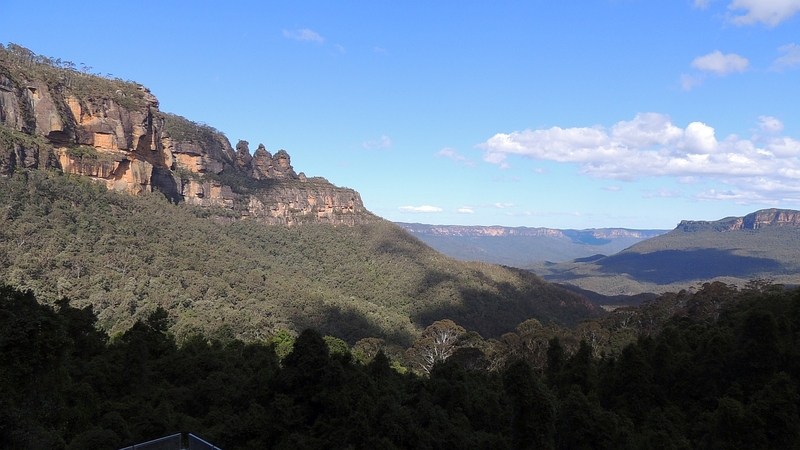 It takes around one and three quarter hours to get to the first stop which is Echo Point near Katoomba. 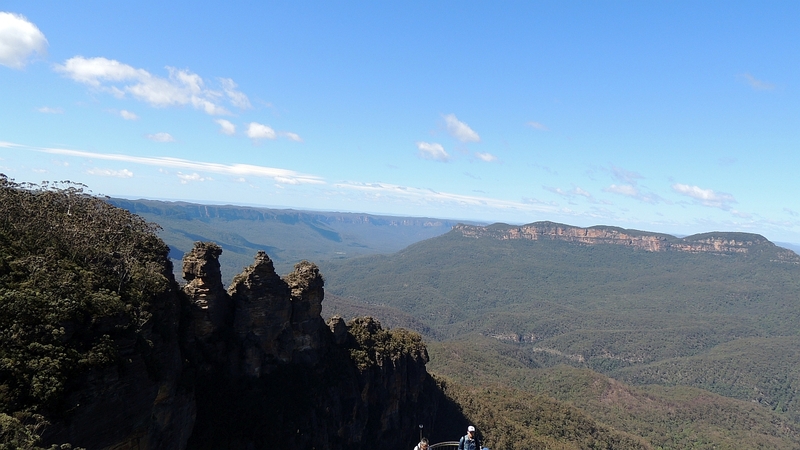 Perched on the edge of an escarpment this scenic look out gives panoramic views of the Blue Mountains, the Kanangra-Boyd wilderness and the Three Sisters. 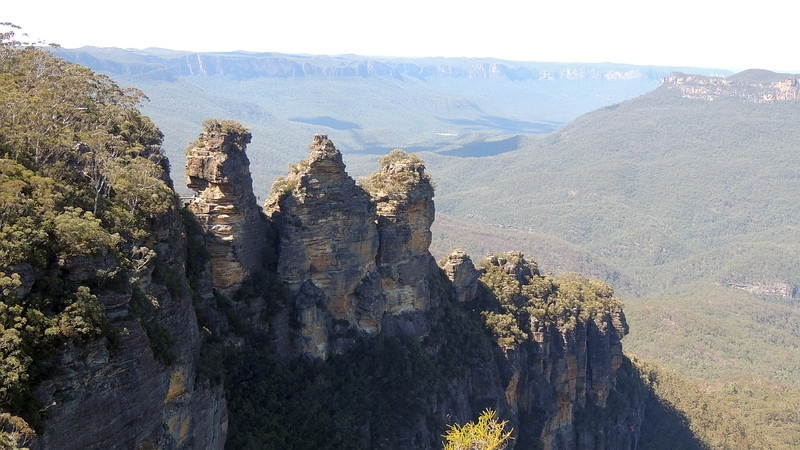 The Three Sisters is a rock formation towering over the Jamison Valley. The scenery is breath taking and as it is such a clear day we can see for miles in all directions. Although it's beautifully sunny there's a sharp wind and the mountain air means there's a real chill in the air. Luckily Serena and Fiona were prepared and we have thick coats and hats to wear to keep us warm. Perry is very excited to take us to our next stop as it is a real favourite of his. 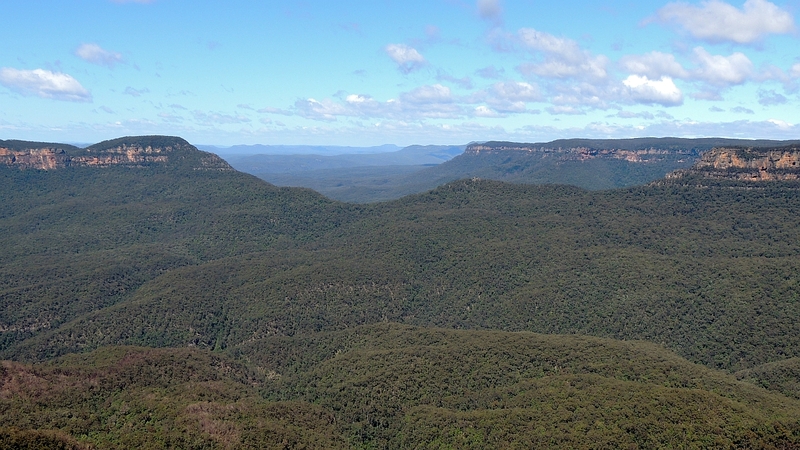 So back to the car and we drive the short distance to Scenic World which we could see across one of the valleys. 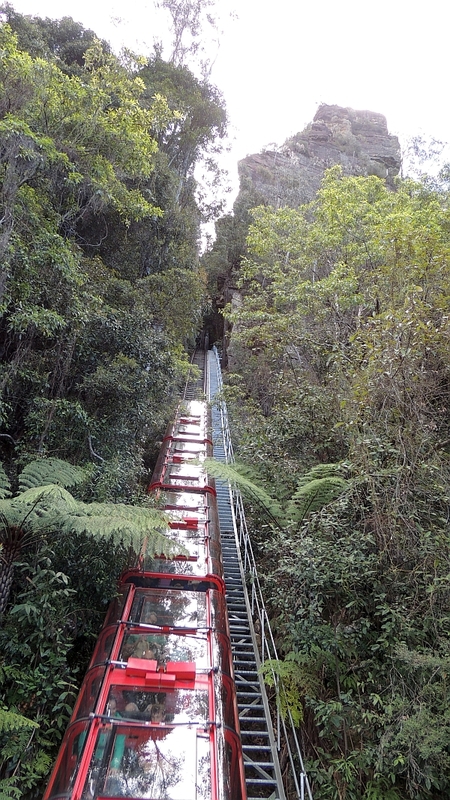 The scenic railway in Scenic World has actually been operating as a tourist attraction since 1945 but in 2013 it was re-developed and now provides a skyway, cableway and various scenic walkways in addition to the railway. 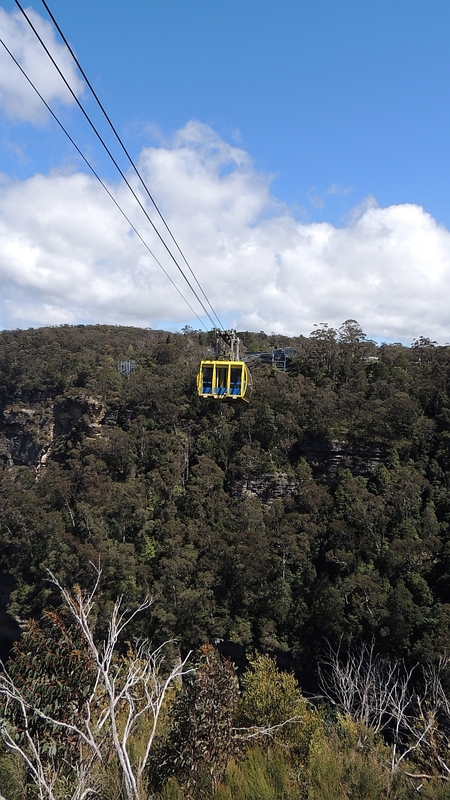 Our first ride is on the yellow skyway. 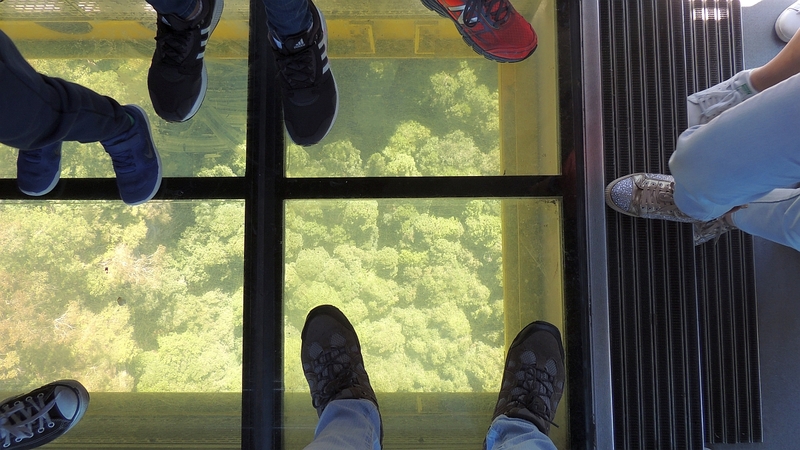 Perry is keen that I stand on the middle cloudy glass section of the gondola - so being a good Aunty I oblige him. We set off across the Jamison Valley and within seconds I see why he was so keen to position me there, as the once cloudy floor is now transparent and the rainforest canopy and valley floor is directly below me. Funnily enough for someone who doesn't like heights I don't find this too distressing and enjoy the rest of the journey across to the other side. 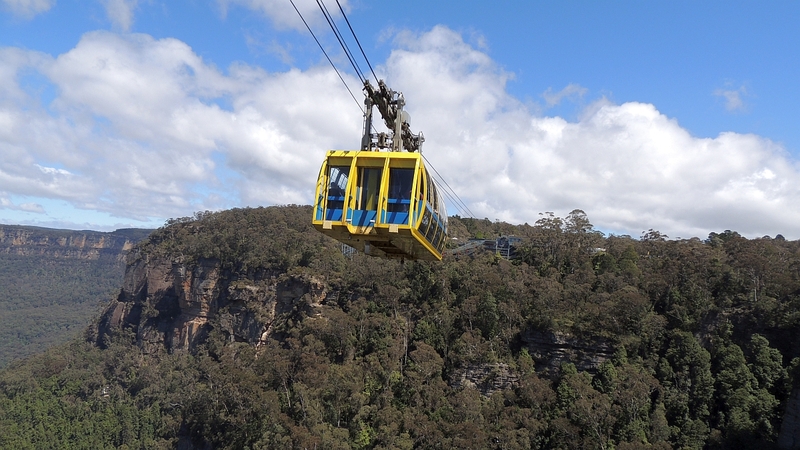 The cable car is 270 metres high and travels for 720 metres and gives a 360° view which encompasses the Three Sister, Katoomba Falls and Jamison valley stretching into the distance. 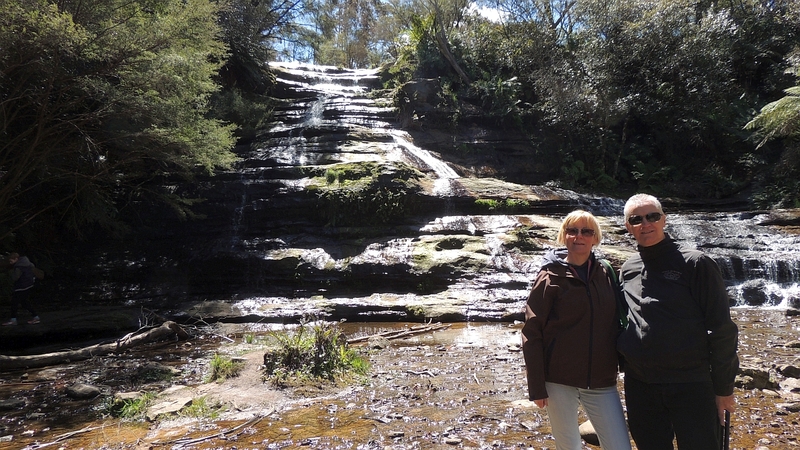 We exit the skyway and take a short walk to a small waterfall and river area. where we have a wander round before returning on the skyway back to the Top Station. We decide to grab lunch now before trying the other rides so we have a wrap and a drink before heading over to the Scenic Railway. 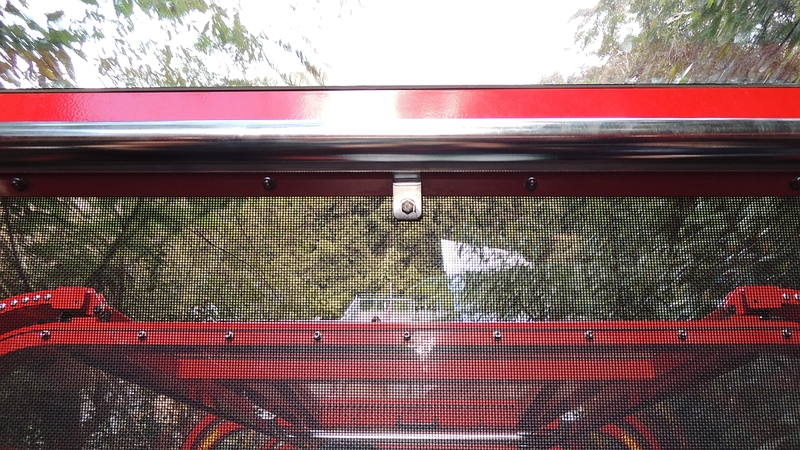 The Scenic Railway at 52° is the steepest passenger train in the world and travels 310 m down to the forest floor. 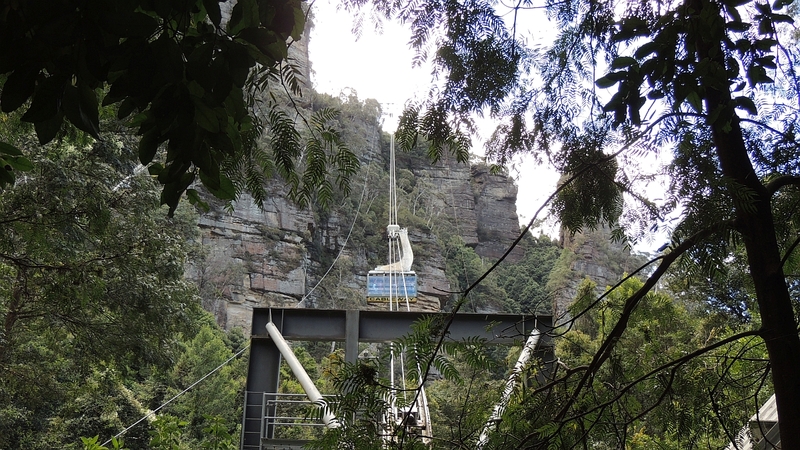 It was originally constructed in 1880 to haul coal and shale from the valley floor up to the escarpment. Between 1928 and 1945 it was used for the mining during the week but visitors used it at weekends. The journey down isn't as scary as I first envisaged as it doesn't go too fast so it's not like a roller coaster ride. Once at the valley floor we head out on the elevated walkways through the rainforest. There are various items depicting it's mining history including the entrance to the mine, mining equipment and also lots of information about the flora and fauna in the forest. There are various guides who are available to give more information about the surroundings and the whole area is very well set out with various length walks available to suit everyone. We see a native lyre bird scratching through the undergrowth and the wonderful surroundings are enhanced by the sounds of the forest birds. 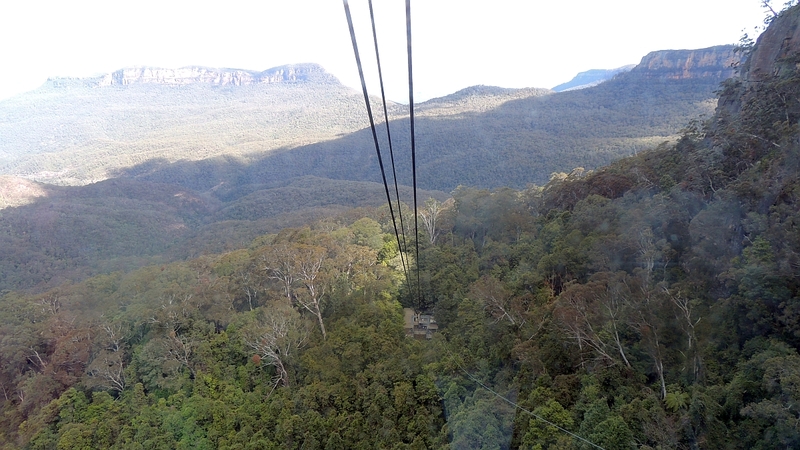 Perry decides we should go back up on the Cableway - this takes 84 people and is Australia's biggest cable car and travels 545 metres up to the top, however once at the top he decides he must have one more trip on the railway so we take another trip up and down on that so we have down almost every combination available. 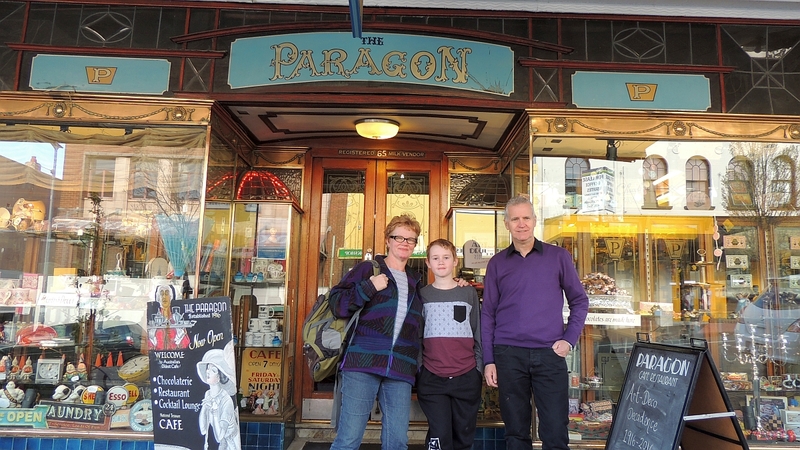 Time is getting on so we head home but not before Fiona makes a stop in the village of Katoomba to visit The Paragon. As we draw up outside it's like stepping back in time - the window display is a homage to all things Art Deco and once inside the vision doesn't stop. Opened in 1916 by a 19 year old Greek boy Simos who called it a "Sundae and Candy Shop" but named it The Paragon as there was already a Paragon Printing Works and a Paragon Theatre in the town. At the end of the second world war a Danish sculptor Otto Steen was commissioned to carve a series of alabaster classical figures to be attached to the maple wood walls. 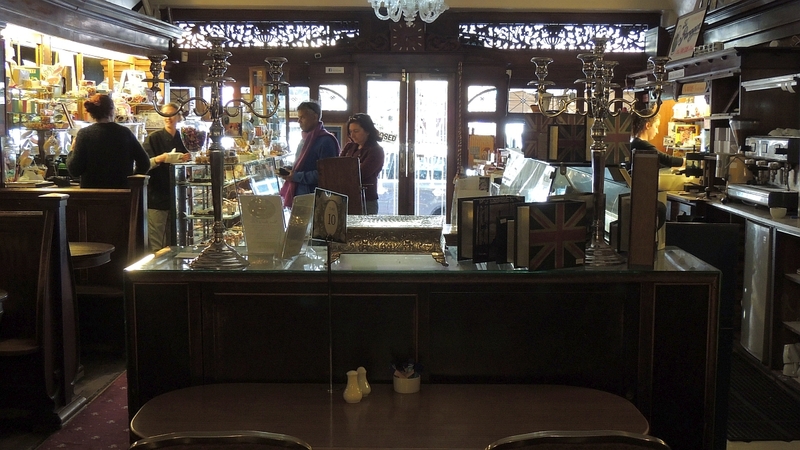 The decor is amazing - so much detail and wonderful lighting - the front of the shop sells a stunning array of chocolates and these are still in the same style of boxes as they were 80 years ago. In the back is the quaint tea rooms where we take a seat before being served. We enjoy delicious hot chocolate served with home made marshmallows or English tea. Kev and I share a carrot cake and there are a number of other delicacies that Serena, Fiona and Perry enjoy. Feeling very full and warm we leave this lovely establishment and start the journey home. We stop at Don's liquor store where there is a huge choice of beers, spirits and wines available to choose from. We grab some beers and once we get home order pizza. Enjoy pizza and beer before teaching Perry how to play Racing Demons card game - which he enjoys and soon picks up. By 10pm the fresh air, beer and food take their toll and we head to bed.